Inhabitat recently had the opportunity to borrow the new Honda CRZ Hybrid with manual transmission to test how this sporty configuration works with a hybrid propulsion system. Boy, does it. We zipped around town doing errands, avoiding traffic, and breaking stereotypes about hybrids being underpowered. 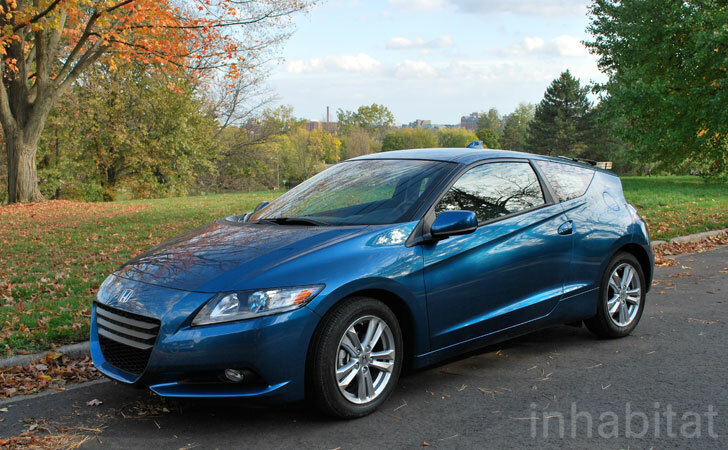 The 2012 Honda CRZ Hybrid is anything but! For just under $20,000 starting price you get two front seats, cargo space in back, and three modes to choose from: ECON, Normal, and Sport. How sporty is Sport mode, really? We’re so glad you asked. It’s surprisingly powerful, actually–even coltish. The CRZ feels a bit restrained in ECON mode, though not nearly as much as in other Honda hybrids, and Normal mode gives it as much zip as a regular sporty Honda coupe. Push the Sport button, and suddenly the car wants to leap out of the gate at every gear change, straining against the clutch. Yes, really. Drawbacks? Well, those two seats limit the car’s usefulness to anyone other than singles with a date in tow. That keeps the weight down to offer you this performance, however. Also less than stellar is the gas mileage, which averages 40 mpg but quickly rises or plummets on your decision to drive in Normal or Sport mode. You will have to be careful to rein this little beast in, if you’re lucky enough to get one. We’re thrilled Honda has proved hybrids can be sporty and fun to drive, and done it in such a nice little package. Click through our gallery below to see more details on the inside of this dark horse hybrid. The CRZ was a great car in which to zip around town, taking us to a park overlooking Ann Arbor, Michigan, and helping us navigate traffic with ease. With that rear window wiper, the CRZ looks almost like a Prius from the back. But walk around it and you can see the sportier urban vehicle shape and the more compact size. See the pinched rear end? That hatch door contains generous cargo space, but no rear seats for passengers. We wish they offered a third seat centered in the second row for small families. The rear of the car is part sport part hybrid hatch. It works well. The car looks sporty and keeps its green cred under wraps. A hipster pushed his way up the steep hill past us during this photo shoot, refusing to look at the car. Adding to the irony was the fact that the scarf-wrapped rider's bicycle squeaked loudly with every turn of its front wheel. Sporty grille, smooth exterior. The only hint that you're driving something green is that the rear end tapers sharply at the back, leaving no room for pesky passengers. Somehow these classic Honda headlights found their way onto this car that looks anything but classic, without upsetting the balance of the design. Details like this door handle keep the car feeling sporty and unique from the rest of Honda's vehicle line. Another standard Honda design element that has made its way to this car without ruining the hybrid's sporty looks. How do they do it? The antenna on the roof is molded into a shark fin. Nice touch. The rear window is almost horizontal, which makes for some odd reflections in the rearview mirror. We wonder if this element of the design will continue to be in flux for a few generations of the car. The hatch door is large but is still easy to operate. There is plenty of space for errand runs in the CRZ, just as long as you leave friends and family at home. The coupe door is heavy but not unwieldy. It won't embarrass you by swinging back on your leg when you're trying to make a graceful exit from the low vehicle. The interior is roomy for a two-seater, but don't forget you can't take your friends with you. A good car for singles with friends who already have their own squeaky bicycles to help them get around town. The cockpit is classic Honda small car, but with sporty details and a solid quality feel. 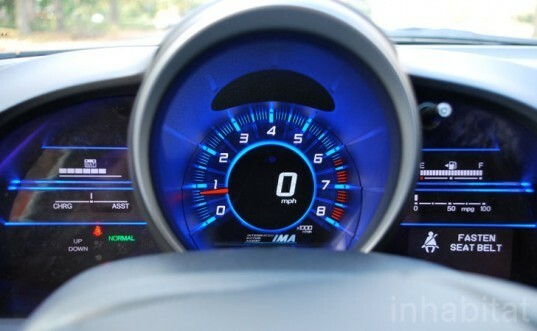 The instrument cluster makes the interior of the vehicle with sharp, high-contrast graphics and easy readouts. There is no lack of power in this hybrid. ECON mode feels a little restrained, normal mode feels zippy, and sport mode feels like you're riding a horse trying to burst out of the gate. The steering wheel contains info, mode, and voice controls and is shaped in the smaller, sportier style that Honda offers for quick driving. Viva la manual hybrid! These pedals aren't exactly drilled for full sport effect, but they work well and feel good to the feet. The HVAC controls are simple, and the navigation system works well. Understated, but lit up with nice blue LEDs everywhere. Honda has reversed the standard HVAC controls to make the dial a temperature selector and the toggle switch the fan speed controller. It takes a little getting used to but works nicely. The navigation system makes you sign the contract every time you turn it on, but it delivers with simple controls that work well. Like with all Hondas, there is a toggle button that allows you to glide over the map to view your surroundings. It sounds so simple, but this one feature makes a navigation system your friend instead of foe. Radio and audio controls are all accessed through the navigation screen. USB port, power plug and aux input are all present and accounted for on the front of the center console, where there is a little cubby to store your iPod. The gear shifter is the round and solid one reserved for Honda's sports cars. We love its stout height and precise action. It definitely doesn't feel like you're driving a hybrid. Just in case you were thinking of putting a car seat back there, the large sticker warns you off. Not safe, don't even think about it.